Jimmy Hinds was a young teenager in early 1960s when he and his brother discovered a record store on Natural Bridge Road in north St. Louis. They would hang there for hours looking through the record bins. Hinds sensed something special about the place, but didn’t know what it was. What he did know was that when they got to the cash register with records and no money the owner, Oliver Sain, would smile, sell them the records on credit and tell the boys, “I know where you live.” It was the start of a relationship that would define the sound of St. Louis. Born on January 9, 1950, Hinds was a Homer G. Phillips baby who grew up with a mother who loved art, a harmonica and guitar-playing father, five brothers and two sisters. In their North Market Street home his dad would only allow records by Howlin' Wolf, Lightnin' Hopkins, Muddy Waters, B.B. King and Bobbly Bland to be played. No James Brown for him. Hinds, the second oldest boy, was one of the six siblings who would become musicians. Four of them, including Jimmy, were drummers. However, he was always the music director in their legendary third floor “Music Room” which was also doubled as his bedroom. The 45s from Sain’s record store became the tools that Hinds used to learn music. To this day, his brothers are still amazed at how good Jimmy was with tools and needles. “He would break down records on their stereo into individual tracks,” his brother Jerome said, “so he could learn each part.” His brother June Hinds remembers the many times he would find “Jimmy laying on the floor surrounded by 45s listening and practicing.” His ear for the right sound and precision would become a career-defining work ethic. Music, the third floor, and Sain’s record store (which became Archway Studios in 1965) were central to the Hinds family life. June Hinds remembers how “the music grabbed all of us and kept us out of trouble and if we were doing wrong my mother would threaten, ‘I’ll go tell Oliver.’” Jimmy Hinds controlled all the music on the third floor, as well as downstairs at his parent’s card parties where he played DJ for tips. As he learned the music he would go back up to Natural Bridge to show Sain his moves. “I knew there was something more going on there from the first time I went in and I knew he saw something in me,” Hinds reminisced. That got Hinds started on the bass, but it was the sound from Motown’s legendary Funk Bothers bassist, James Jamerson, that got him hooked. 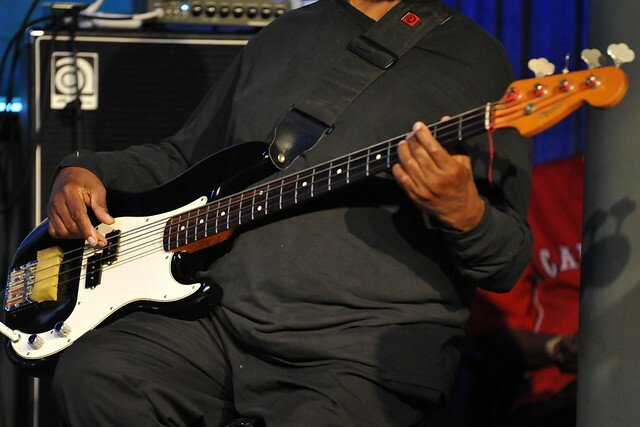 Self-taught through records and constant practice, he said, “I mastered Jamerson’s open string technique and learned how to control the strings so they don’t hum and bump into each other.” Chuck Rainey, a legendary New York bassist and studio musician who played with Aretha Franklin, The King Curtis All Stars and toured with the Beatles was another favorite. Unfortunately, with the Vietnam War raging, the government had other plans. After his first show as a member of Bland’s band, his draft notice arrived back home. By the end of the year, he had been inducted into the U.S. Army 2nd Division. He was stationed at Ft. Hood, Texas as an MP and band member. He had never played upright bass, but when auditioning he proved he could. The assignment turned out to be a lucky break. To keep the core of the band intact, the Army kept its best musicians like Hinds stateside. He once was pictured on the front page of the Army Times exiting a Huey helicopter holding his bass overhead. Following his two years in the service Hinds returned to St. Louis and immediately headed to CMC and KBK studios to see about staff musician opportunities. They had no idea what he was talking about so he headed over to Archway. Hinds knew he wanted to record but even more than that he wanted to become a producer and arranger. That was fine with Sain who knew Hinds focused approach to his Fender Precision bass and his ear for music. When you ask Hinds about any favorite memories you get a long pause and an admission that, “as a band leader there was so much going on and I was so focused that it is hard to single one event out.” Then the memories start to roll: the first Fontella Bass European tour, the 1982 Larry Davis album “Funny Stuff” with Johnny Johnson (piano), Billy Gayles (drums), Jimmy Hinds (drums/bass), and Oliver Sain (sax/horns), playing with Percy Mayfield in 1984 in Long Beach CA (he died the next day), the Oliver Sain Soul Reunions at Mississippi Nights (1988-1998, musical director), and the 2006 Bo Diddley tour. The 1986 and 1987 St. Louis Kings of Rhythm European tours got a special mention from Hinds. It was an all-star cast of St. Louisans including several veterans of the original Ike Turner's Kings of Rhythm line up: Clayton Love (keyboard), Billy Gayle (drummer/vocalist), Robbie Montgomery (vocalist), Stacey Johnson (vocalist), Oliver Sain (sax), Jimmy Hinds (bass) and guitarists Darrel Darden (1986) and Marvin “Buzzy” Morton (1987). The band was officially appointed as ambassadors for the City of St. Louis by Mayor Vincent Schoemehl. Another favorite was the extended Phil Driscoll gig at the Chase Park Plaza Hotel in the early 70s. At the time, Driscoll was a national figure in R&B and rock. Hinds said the job made him the envy of every bass player in town. “They paid $600 a week and it came with a room. It was big money and set me apart.” Getting the room was an issue. June Hinds laughs when telling how the Chase owner, Hal Kopler, eventually had to give in saying, “he gets one room, only one room.” The Hinds brothers loved hanging there while making good use of the room service. And, there are memories of other studios along the way. There was a job with Ike Turner’s studio in Los Angeles where he ended up playing drums because Turner knew he could. Then there was the one that didn’t happen. In 1978 he signed a deal with Motown and Gwen Gordy Productions (Barry Gordy’s sister) to produce some girl groups. But, without telling anyone, Gordy abruptly sold Motown. The sale immediately cut off all the funding and Hinds had to walk away. It didn’t matter, Archway was always his home, he said. The one thing you learn when interviewing Jimmy Hinds is that he prefers long-term commitments. While he traveled and played with many acts over the years, he liked regular jobs. Archway was his day job and at night it was Hilary’s in Soulard. He formed Hilary’s Coalition in 1977 to be the house band. Five years later, when the club owner told Hinds he needed to get a female vocalist, he knew exactly who to ask. It was that sweet girl he met in fourth grade, his buddy Marvin Evans' twin sister, Marsha. There was never a doubt in Hinds mind. “In music,” he said, “the one they [other singers] fear is the one you want and they all feared Marsha.” In 1982 the band became Marsha Evans and the Coalition. They would play 4-5 times a week for decades. Evans had grown up in music. Her father, Leonard Bolar, was the lead trumpet in the jazzy George Hudson Band when his 16-year-old Marsha joined their singers, The Georgettes. Becoming a big band jazz soloist and working with the acclaimed mini Motown East St. Louis model cities program, the Young Disciples, paid dividends. It led to a lifelong-friendship with another extraordinary bassist, Gus Thornton and ultimately to meeting Oliver Sain. She became a mainstay at his Archway Records (vocals and background) and with his band. Ironically, Evans and Hinds never really saw each other at Archway. Marsha was a full-time teacher so their schedules put them in the studio at different times. But, they were always aware of each other’s music. When Hinds approached her about joining The Coalition she jumped at the opportunity. Once they started, Hinds said, “I knew I would never want to work with anyone else.” Evans smiles when she talks about how easy it has been. “We always understood each other musically since the beginning and he allows me to be a creative artist. He is the very best at his craft.” Getting married sealed the deal for life. And, if you don’t, Hinds will let you know. “I’m the old guy who gets on you heavy if you can’t shuffle.” He worries that young players make a mistake in going for speed and that the rise of the keyboard bass is replacing real bass players. This article is co-published by the St. Louis Blues Society and KDHX. Be sure to check out a collection of photos featuring Jimmy Hinds.